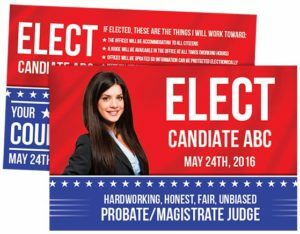 Running a campaign comprises more than just registering as a candidate and letting your friends and family know you are running for political office. It involves putting up a website, social media pages, fundraising and canvassing. Canvassing is a huge part of campaigning but what do you leave behind when you speak with your constituent? There are a number of items you can handout. Let’s take a look at effective political campaign materials. Postcard – multi-faceted in its use. You can mail them and hand them out when you go door to door canvassing neighborhoods. You can also use them at rallies or when you are talking with neighbors. Inexpensive and effective in getting the word out about your candidacy. Posters – posters are an effective means of promotion of your candidacy and can be put up in libraries, local coffee shops, festivals, etc. Of course, you will want to get permission before hanging up your political poster but it’s a good way to get exposure and your message out at the same time. Brochures – like postcards they are inexpensive to print and can have a big impact. These are items you should carry with you at all times so when you are talking with potential voters you can hand them information about you and your platform. 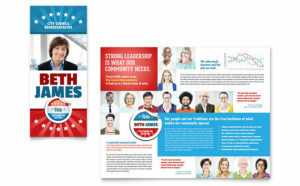 If you are on a tight budget, and most candidates are, how will you get your printed material (and logo for that fact) designed? You actually have some inexpensive options. Most print companies have designers on staff. Vistaprint will design material starting at $5 and if you order the design they apply the design fee to the purchase. Canva.com is a free tool that allows you to easily design postcards, brochures, posters, etc. You can download print quality files and have a printing company print them for you. Upwork.com and fivver.com are sites with freelancers that will do anything from design a website to graphic designers. Look for freelancers with 5-star ratings and 90%+ re-hire for the best talent. What should go on your printed material is of utmost importance when designing your printed material. Make sure your message is clear and concise, it is uncluttered and it is easy to read what you stand for and why. You won’t have a lot of time to grab someone’s attention, you will want to make sure that your message stands out. Want to know how Handraiser can help you win your election? Schedule a live demo here!